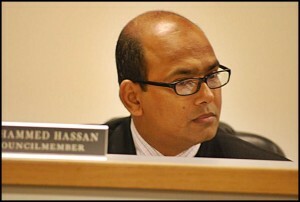 City Councilmember Mohammed Hassan failed to live up to an agreement with the city to pay his water bill. As a result, the city said it shut off his water service on Wednesday at his house at 2425 Neibel St.
Back in August, City Councilmember Mohammed Hassan promised the city he would make good on $758 owed for water service. According to a written agreement obtained by The Review through a Freedom of Information Act request, Hassan promised to make that payment by Aug. 21 after first immediately paying $800 that was also owed. That second payment never happened and on Wednesday, the day The Review received a copy of the agreement, his water service was shut off at 2425 Neibel St., said Emergency Manager Cathy Square. Hassan, who is seeking re-election in the Nov. 5 General Election, told The Review his water was not shut off, and that he had another agreement with the city to keep his water on until he paid the balance of what he owes on Friday, Oct. 25. Water Department Supervisor Cheryl Karpinski confirmed that arrangement, but said it was discovered that Hassan had failed to live up to an agreement made previously in August. “Cathy Square told me to keep him on the shutoff list,” Karpinski said. Hassan also questioned The Review’s inquiry into the matter. “The paper should be neutral,” he said. Hassan’s delinquency and failure to live up to his agreement with the city raised the question of whether he is now a defaulter to the city. According to the city charter, any elected official who is a defaulter has violated the charter and gets kicked out of office. Emergency Manager Square said that to determine that or to take action to remove Hassan would require hiring the city attorney and going to court – something that she is not prepared to do. “These are things that cost the city a fortune,” Square said. Square said she has to concentrate on fixing Hamtramck’s finances. “It’s best for me to focus on the job here,” she said, and declined to comment further. During the summer, the city waged an aggressive campaign against homeowners who had fallen far behind on water payments. The city began a series of water shutoffs, which resulted in hundreds of homeowners making immediate payments. At the time, $600,000 was owed to the city. The Review talked to Acting City Manager Kyle Tertzag when the crackdown began about the impact of that much money being delinquent. “It’s money that’s sitting out there that crippled the city’s ability to maintain its infrastructure – which has resulted in basement floodings,” Tertzag told The Review. Hassan’s water bill has also cast light on another matter. In his water bill agreement with the city, Hassan says he is the owner of his house at 2425 Neibel St. But according to property records at the Wayne County Treasury Office, the owner is Omar Nakash. Nakash owns Platinum Landscaping and is a contractor with the city. His company was hired to clean lots, remove trees and plow the city streets during snowfalls. Nakash is behind in property taxes owed to city for the past three years for that property, and owes a total of $6,613. His house is now facing foreclosure, according the County Treasurer’s Office. The Review became aware of this tax delinquency a few months ago and at the time Nakash said he was going to pay the bill. That, too, has yet to happen, according to the county. According to city records, from 2009 to September of 2012, Nakash’s company, Platinum, was paid $1.8 million for its services. Emergency Manager Square said she was unaware that Nakash owed property taxes. She declined to comment on the matter. Unlike some other cities, Hamtramck does not have an ordinance that requires contractors to be up to date on money owed to the city. Mayor Karen Majewski said she would urge the city council to consider adopting a similar ordinance. “But I don’t expect that to happen,” she said. Platinum currently has a contract with the city with no expiration date. Last October, then Acting City Manager Kyle Tertzag asked the council to allow him to rebid the contract. That motion failed with Councilmembers Abdul Algazali and Tom Jankowski voting in favor of rebidding, and Councilmembers Cathie Gordon, Anam Miah, Robert Zwolak and Hassan voting against it. Hassan was presumably renting or purchasing the Neibel St. house from Omar Nakash, the owner of Platinum, at the time of the vote. He did not disclose that relationship at the time of the vote. I wonder if the Bangladeshi community will protest and rally the discriminatory actions of the Water Department for shutting off Mr. Hassan’s water. Sarcasm aside, I wanted to note that Square says its best for her to focus on her job. What exactly is her job and is she actually doing it? Hassan is a Pakistani not bangladeshi. When he goes to Dearborn he says he is yameni.